This week is National Women’s Health Week. It’s also now five months since January when many of us made New Year’s resolutions. For most of us, those resolutions included health and wellness goals. This week, even if you got sidetracked and gave up, get yourself back on track. Thirty minutes a day, three times a week. If you’re looking to drop a few pounds, then along with a balanced meal plan, you have to bump up your gym time to four to five times a week. Start off slow and build your endurance (tolerance) up. Take a short walk with your partner after dinner. Exercise during the commercial breaks while watching your favorite novelas. If you go to a gym, try taking a class. You’ll probably burn more calories during that class than walking on the treadmill while a) talking to the person next to you b) texting c) reading a magazine/watching TV. I’m not judging… because I used to do that too. Then I would get frustrated and want to give up when I didn’t see any results. Get in there and get it done. Addicted to soda? You’re not alone. Instead of switching to diet soda (just as bad in my opinion), start off by swapping one of your normal cans of soda for a bottle of water instead. Try seltzer water. If you’re going to do flavored water, make sure you read the back of the label because sometimes they have just as much sugar as a can of soda. If you’ve finished eating and still feel hungry, drink some water and wait. Give your brain the time it needs to receive the signals from your body telling it that you’re full. Take some time for yourself each week. Mental health is an important aspect of living a balanced life. Wake up fifteen minutes earlier than usual and try meditating, or write in a journal. Schedule some time to catch up with your girlfriends, or have a date night. Try unplugging from the world for a half hour. Read 50 Shades of Grey, I hear it’s juicy! Prevention will not only save you money in the long run, but may also save your life. We just celebrated Mother’s Day yesterday. What would you tell your mom if she mentioned to you that she wasn’t feeling well? You would make her go see her doctor ASAP. Same thing goes for your children. Get a physical if you haven’t already this year. Go see your gynecologist and get your pap test done. 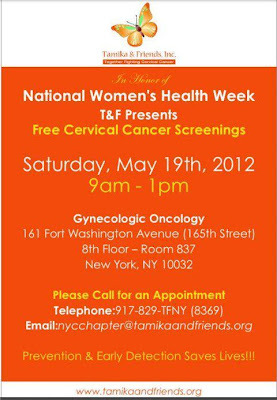 If you live in the New York area, you can get screened for free this Saturday at New York Presbyterian Hospital courtesy of the gynecologists there and the New York chapter of Tamika & Friends, Inc. Make your health a priority.